How would you like to visit Santa Fe, spend a day with me, see my collection of toy knights and medieval miniatures, sample some green chile and carne adovada, then take a helicopter down to Candy Kitchen, New Mexico and the Wild Spirit Wolf Sanctuary to meet the Westeros pack? I've teamed up with the good folks at Prizeo.com to raise some funds for two of my favorite charities -- the aforementioned Wild Spirit Wolf Sanctuary, and the Food Depot here in Santa Fe, where they feed the hungry people of Northern New Mexico. Win the grand prize, and we'll fly you in from wherever you may be in the world for the day described above. Every donation has a chance to win... but there are all sorts of other cool premiums and prizes as well, for various levels of donations. T-shirts, signed maps, signed books,a signed script, breakfast at worldcon or comicon. You can die horribly in WINDS OF WINTER... and I'm even donating my well-worn Greek fisherman's cap! Win or lose, it's all for a good cause, or rather two good causes. 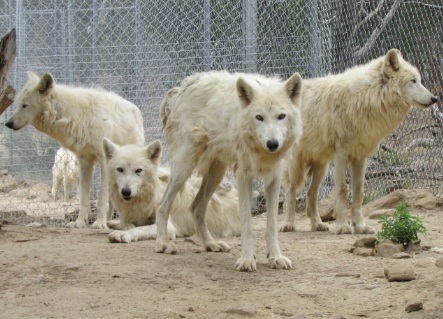 Help the wolves, and feed some hungry people. Man alive, do I wish I had $20,000. :) That would be incredible. I'm still going to donate. Very excited about this!! Or make them a character in your book. And you could make people, who give money, a minor character in one of your new books and let them choose their name in the book and how they die. This is awesome—I just entered and shared on the Face Place. My boyfriend and I are trying to take a trip to every state capitol, so this would be convenient. :) What a cool contest, regardless. Thanks! Or make them extras on the show and let them take a swim with Missandei. I'm from Brazil and i'm donating for the good spirit of charity, if i win, you can just mail me with a new chapter of ASOIAF! Jk, this is an amazing idea! Happy to donate to a worthy effort. The wolves are beautiful! If your running out of character names you can use my name Trevor and make it Trevyr. I could be a Knight from the Vale that Littlefinger kills for looking at Sansa or something. Dying horribly in The Winds of Winter is a hilarious prize. Not the Greek Fisherman's Hat! Not the hat, take my eyes- but not the hat! We Greeks have very few sources of pride (my Yia Yia still raves about Dukakis for heaven's sake), you wearing the iconic Greek Fisherman's hat is one of them. I hope you have a back-up hat or two. Re: Not the Greek Fisherman's Hat! Yes, I have others. Have no fear. Just donated! The cause and the prizes are all really great so I'm glad to aid where I can. As I named my dog Summer, I felt that it was important. Anwyay, even without this contest, I would really love to go out to Santa Fe to check out your theater and all of the other cool sites of the city. Hopefully there will be a con there sometime. What a great cause ! Very awesome indeed!! And, the prizes are also quite something - appearing in the novel, wow! I shall definitely donate - though I'm unsure at this point on the 'level'. Where would I be? Who would I meet? Who would kill me?